No other edition offers extensive textual apparatus such as explanatory notes, plot summaries, particularly vital as stories are complex and interwoven.The Sultan Schahriar's misguided resolution to shelter himself from the possible infidelities on his wives leads to an outbreak of barbarity in his kingdoms and a reign of terror in his court, stopped only by the resourceful Scheherazade. The tales with which Scheherazade nightly postpones the muderous intent of the sultan have entered our language and our lives like no other collection of narratives before or since. Sinbad, Aladdin, Ali Baba: all make their spectacular entrance on to thestage of English literary history in the Arabian Nights Entertainments (1704-17). 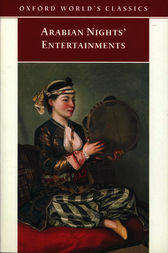 The stories contained in this `store house of ingenious fiction' initiate a pattern of literary reference and influence which today remains as powerful and intense as it was throughout the eighteenth and nineteenthcenturies.This edition reproduces in its entirety the earliest English translation of the French orientalist Antoine Galland's Mille et une Nuits. This remained for over a century the only English translation of the story cycle, influencing an incalculable number of writers, and no other edition offers the complete text supplemented by full textual apparatus.ABOUT THE SERIES: For over 100 years Oxford World's Classics has made available the widest range of literature from around the globe. Each affordable volume reflects Oxford's commitment to scholarship, providing the most accurate text plus a wealth of other valuable features, including expert introductions by leading authorities, helpful notes to clarify the text, up-to-date bibliographies for further study, and much more. Robert Mack is Assistant Professor of English at Vanderbilt University, Nashville, Tennessee. He is also the editor of Oriental Tales in World's Classics.